From left to right: IsaDora 651 Silver Sparkles, 652 Gold Sparkles, 728 Black Galaxy, 750 Polar Nights, 870 Silver Bling, 871 Gold Digger, 872 Jet Setter, 874 Rocky Ruby, 875 Glowing Beetle, 878 Lilac De Luxe. 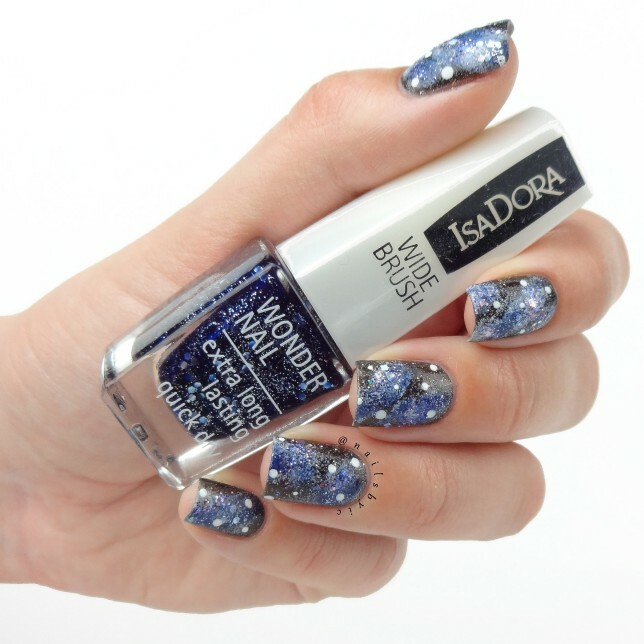 In IsaDora’s nail polish collection for the holiday season 2015 they have gathered some beautiful shimmery and glittery polishes, including the holographics! I’m so glad that the holographics are back because they are just the best glitters! They can be used as a topper or on their own, however you like. 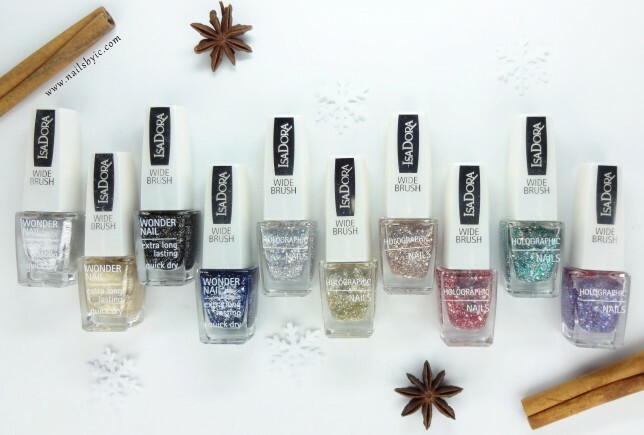 Check out the nail art below for some holiday/Christmas nail inspiration using polishes from this collection. For the first one I used Rocky Ruby and Glowing Beetle over a black base. It’s a perfect combination for Christmas and I love how it turned out! Super glittery but still quite simple. For the second mani I used a bunch of different polishes. 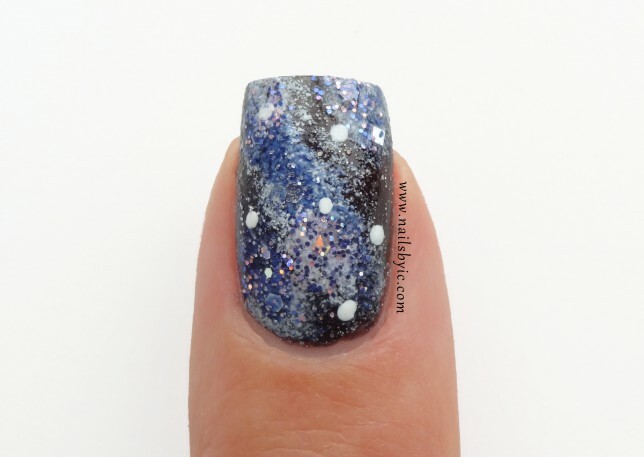 The base is Black Galaxy (guess where I got the inspiration from) and on top I sponged Polar Nights, Lilac De Luxe and White China (not in the collection). To use a peel off base was really helpful for cleaning up around the edges and also for taking off the polish later on. Check out the video below to see how I did this mani. For the last mani I did a simple but really cute one using White China and Silver Sparkles. 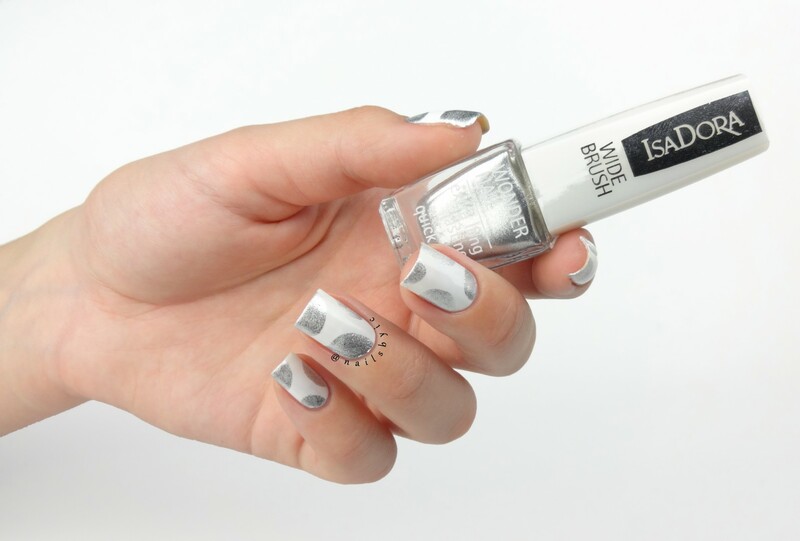 For this mani you don’t need any tools at all, just apply the silver directly with the brush. However, a good tip is to use peel off base around your nails or otherwise clean up will be super difficult and you will end up with glitter everywhere! For more of my nail art, check out my Instagram @nailsbyic or my YouTube channel Nails by IC. Disclaimer: This review is based on my honest opinion. I have not been asked to do it and I am not getting paid for it. I received the polishes as a PR sample.